Summer Camp over the years hasn’t just been a place for young people to learn and grow away from home in a natural environment with kids from other schools, states and even countries; it’s also been a place movies and television have frequently drawn inspiration from for movies and television shows. Pop culture has borrowed so much from the traditional overnight summer camp experience. Dozens of movies and TV shows are set at summer camp. One of the things that often stands out about these pop culture depictions are the T-shirts. It makes sense too because anyone who has ever been to camp knows how proudly they wore their camp shirt and how much they looked forward to seeing what new shirt they would acquire (and inevitably tie dye at some point) each summer. 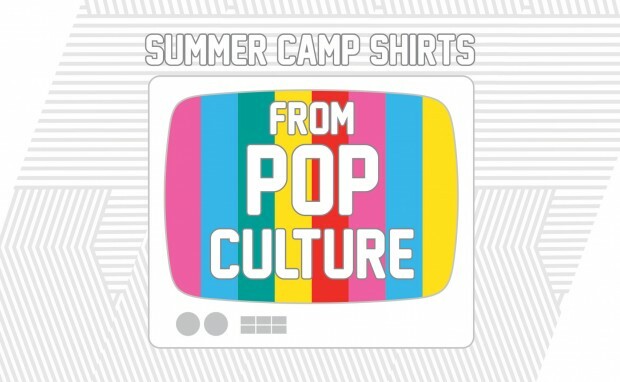 Here are some of our favorite summer camp shirt designs from pop culture. Triple R Ranch was the ranch camp from the mid-1950s Mickey Mouse Club series about the adventures of an unlikely pair at a boys’ western-style summer camp. The triangular logo with the camp name and the 3R in the middle reminds us of a classic car logo and communicates the kind of rugged confidence a summer at a ranch camp for boys was meant to instill. The classic logo shirt appeared more recently in the movie Toy Story 2, this time with a cattle head replacing the 3R in the middle. 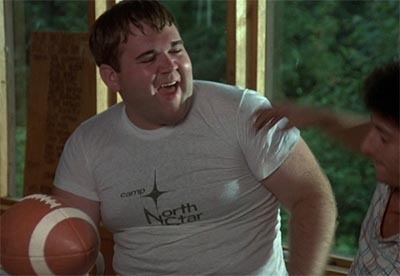 Andy wears the shirt in the beginning of the movie as he prepares to leave for camp. 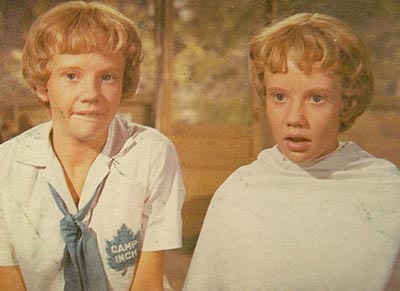 Camp T-shirts weren’t apparently considered appropriate for young ladies at girls camps in the ’60s so the separated-at-birth twins in The Parent Trap (both played by Hayley Mills) wore button up blouses with the Camp Inch logo, a leaf with the name in block lettering. Like so much about the 1961 movie, the simple logo has become iconic and simply communicates, whether on a T-shirt or a blouse, exactly what makes Camp Inch a special place of retreat in the North Carolina woods. Sometimes black or white lettering with the right font on a solid color shirt is all you have to do to create a quality shirt. 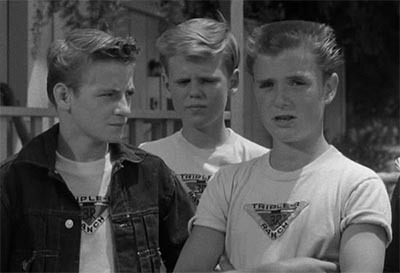 That was essentially the approach with the shirts for the mid-1960s NBC show Camp Runamuck. Plenty of camp shirts in pop culture have taken this approach (the cartoon Camp Candy simply had white shirts with big Cs in red letters, but the unique font is what makes this shirt special. When it comes to camp movies, Meatballs is usually held up as the gold standard because of its star power – Bill Murray before he was Bill Murray – and influence it has had on virtually every summer camp movie that has followed. The North Star Camp shirt, worn by Murray in the opening credits, is a white T-shirt, but the logo uses a simple icon of a star and merges it nicely with the stylized lettering of the camp name. It’s subtle and small but unforgettably timeless. 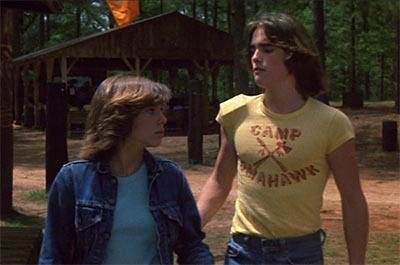 The fact that a young Matt Dillon is wearing the shirt certainly adds some weight to it, but the Camp Tomahawk shirt from the 1980 movie Little Darlings makes good use of the popular summer camp font Pinewood (or perhaps some variation of it) with a bold icon of criss-crossing tomahawks. Add in the pack of cigarettes rolled into the sleeve and it’s hard for a shirt to look any edgier. 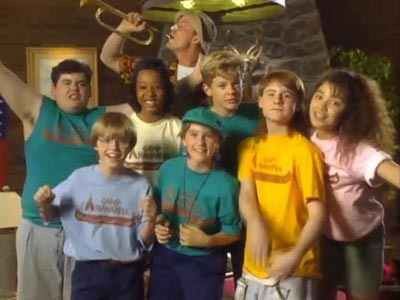 The Camp Anawanna shirt was produced in multiple colors for the show and worked well in all of them. 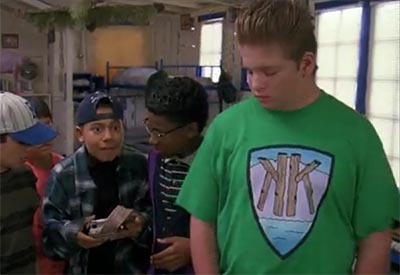 The fact that the camp shirt is the least embarrassing fashion on display in the mid-’90s TV show demonstrates how a simple design can, like quality summer camp programming, transcend time. The opposite facing wood Ks in a shield do make for a cool design concept for the camp shirt in the movie, A Pig’s Tale. An update on the design would probably do something about that purple in the background but otherwise it’s a strong shirt worn here by a camper who never talks. 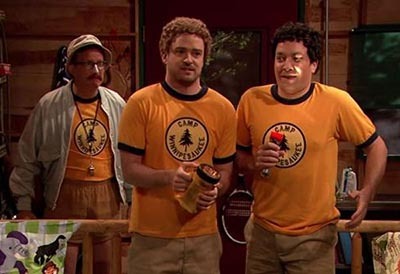 Back when Jimmy Fallon was still on Late Night, he did a couple of hilarious sketches with Justin Timberlake set at the fictional Camp Winnipesaukee. In the sketches they sing “Toto” by Africa and “Only Wanna Be With You” by Hootie & the Blowfish while wearing curly wigs, braces and a camp ringer. Ringers are more costly, but they make for great camp shirts, especially with a strong circular logo with the camp name and a pine tree. It’s hard not to like a shirt worn by three of the coolest YouTubers around – Grace Helbig, Hannah Hart and Mamrie Hart in the move Camp Takota. A sweatshirt with the birds in front of a sunburst also makes an appearance in the movie but isn’t as memorable. So if you’re trying to come up with a classic or memorable camp shirt design that your campers will wear with pride , we’ve got a collection of summer camp t-shirt designs that just might fit the bill. And who knows, your camps shirts may just end up being your own fashion statement.